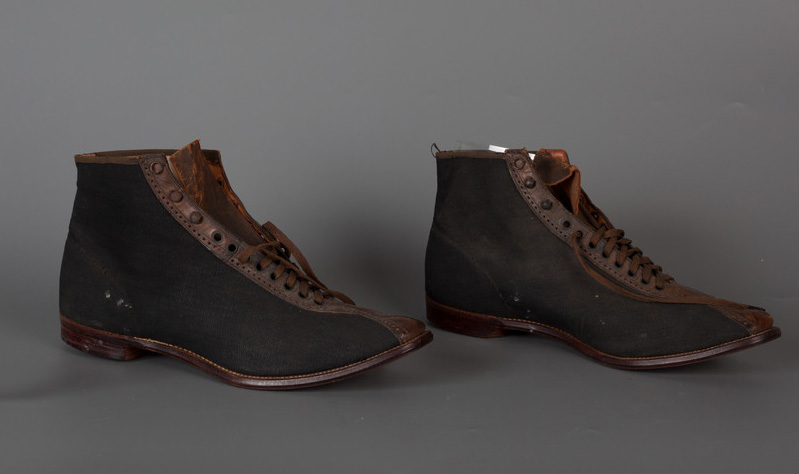 Historic New England is loaning a pair of men’s cycling shoes from the turn of the twentieth century to Pedaling Through History: 150 Years of the Bicycle, The Collection of Glenn Eames, an upcoming exhibition at the Henry Sheldon Museum in Middlebury, Vermont. 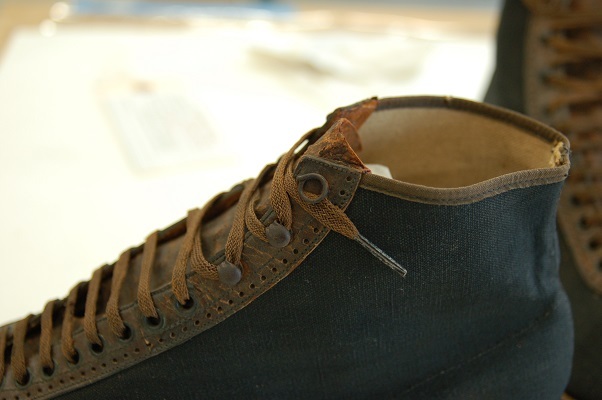 In preparation for the loan, the shoes came to Historic New England’s conservation lab for examination and treatment. These shoes are an example of the innovations of the age, which reached even the simplest of activities: tying your shoes! They have a Pratt fastener at the top of the tongue. Patented in 1896, this device allows the lace to be threaded through and secured by the fastener instead of tied in a bow. Using a Pratt fastener prevents shoelaces from becoming untied and then caught in the bicycle’s gears. Designed in an ankle boot style, these cycling shoes feature a stitched leather and nailed wood sole. The uppers are made of heavy black cotton on the exterior, with brown tooled leather along the tongue and running over the toe. The leather tongue is sewn to the cotton lining on one side. All stitching was done by machine. The ridged leather soles are trademarked Gripsole, presumably useful for gripping bike pedals. 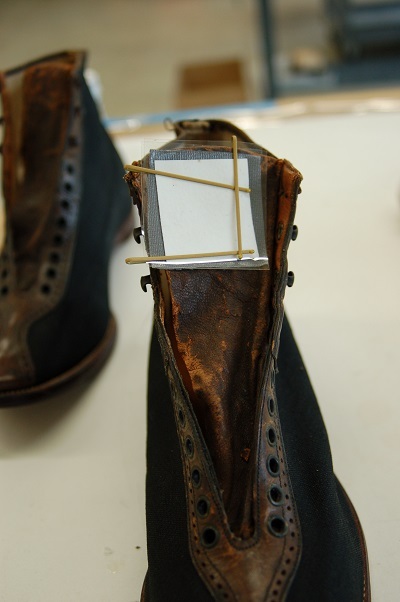 Our conservators discovered condition issues that needed to be addressed before the shoes could go on display. The upper layer of the leather on both shoes was delaminating; in scattered areas, the leather was powdery and prone to flaking. We used a conservation-grade acrylic adhesive in solvent to stabilize the powdery, flaky leather. As you can see in the before treatment photo, the leather tongues were slightly deformed. We humidified the tongues locally to alleviate the deformation and creases. To help support the shape of the shoes, we placed inserts of abaca fiber tissue in the toe and behind the tongue. A curved roll of Mylar was inserted into the back of the shoe. The top of the Mylar was covered with brown cotton fabric, which serves as the show fabric for the exhibition. 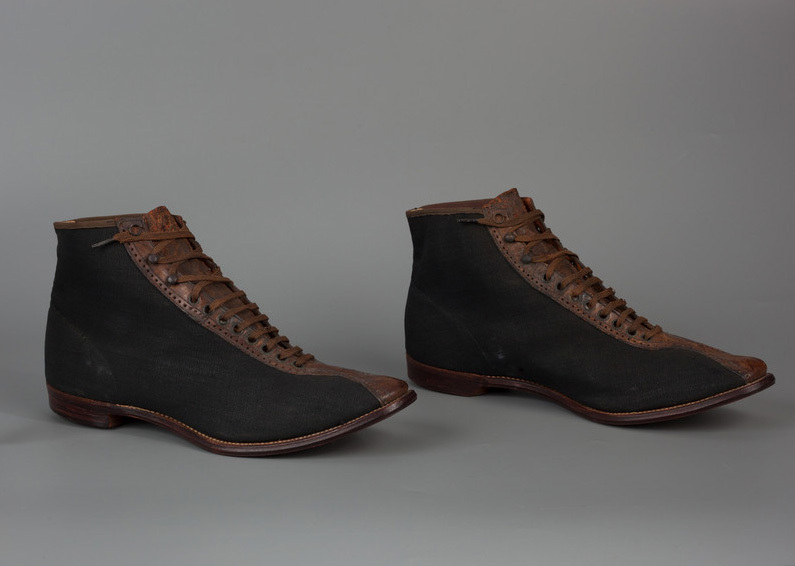 See the shoes in person at the Henry Sheldon Museum, where Pedaling Through History on view from June 21 to October 16. Historic New England members get free admission to the museum.